It’s the world’s first video-enabled beacon. 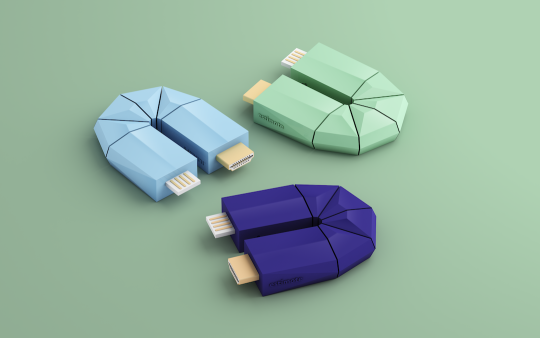 Estimote Mirror can not only communicate with nearby phones and their corresponding apps, but also take content from these apps and display it on any digital screen around you. Weird product shape/form, it’s good it will be hidden behind the display! Gorgeous new edition of the Monome’s Arc knob controller. Check out the really nice IxD of the Arc + Ansible starting near the 4:20 mark. Coros LINX lets you ride with open ears, tune in to your ride and your music, calls, GPS navigation, ride data and more. Connect via Bluetooth 4.0 and control everything on a tiny remote at the touch of your finger. No earbuds required. With this installation you play Pong by pulling ropes. Two people play against each other at a huge game area (10 x 5 meter)! There is no screen involved just ropes and lights. BlokDust is a free web-based music making App, play with synths, samplers & self-playing contraptions, and share your creations. ofxRobotArm is an openFrameworks addon for doing creative things with robot arms. The goal of the addon is to remove as many technical barriers as possible to get up and running with 6-axis robots. We’ve included a number of examples that show you how different ways of controlling and interacting with a robot arm, including direct manipulation, geometry-based manipulation, motion capture-based interactions, and keyframe animation. If you haven’t tried the earlier versions, be sure to check this (updated) one out! Now with great documentation and examples. Gurgles and coos are notoriously difficult to interpret—making it difficult for babies to tell us what they like. So we’ve created an exact, adult-sized replica of one of our best selling strollers to show parents just how comfortable Contours strollers are for their babies.